A Max/MSP controlled interactive installation loosely based on Lewis Caroll’s “Alice in Wonderland.” The program choreographs a dialogue between voices. The Alice character interrogates the Queen’s seductive narration about our “superior new society.” Immersive lighting and sound effects help viewers to feel the stakes in this power play. A Max/MSP controlled installation that captured and mixed current gallery goers’ images with those recorded in a 1993 version of the installation as well as pre-recorded imagery of often naked bodies struggling within the architecture of the museum. A voice activated microphone allowed viewers to add their comments to Scher’s seductive authoritarian monologue. 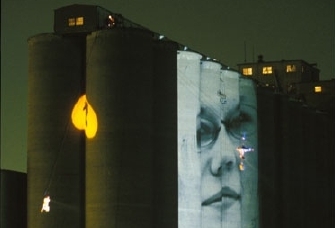 Large scale video projection installation on grain silos for Zaccho Dance Theater’s aerial dance. Pre-recorded & live video were composed and manipulated in realtime as the performance unfolded. Sponsored by the Walker Art Center, Dancing in the Streets, NY and others. 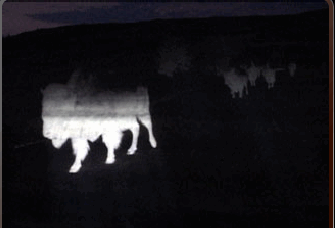 Geyserland was an hour-long immersive experience where the audience boarded a tourist train between Livingston and Bozeman, Montana, and observed video projected onto the passing landscape from projectors on the train as well as hidden scaffolding. Ann Carlson provided an audio commentary to Dan Dobson’s evocative soundtrack while performers on the train engaged the audience. Funded by Arts Partners, the Rockefeller Foundation, and others. Video and sound installation projected on the cobblestones of Water Street in the South Street Seaport, using the history of water use in New York City as a window onto the enduring American practice of opportunistic exploitation. Personal field recordings and early experimental electronic music combined with this looping imagery evokes various historical stages, from pristine wilderness to polluted cesspools, from the logic of networked water mains to the metaphoric tides of contemporary global capital. "Pressure" was a collaborative effort of the students in "Interactive Installation" a class at the School of the Museum of Fine Arts taught by Larry Shea. Technically this class focuses on the MAX/MSP object oriented Multimedia programming language coupled with the I-Cube, a MIDI interface system for connecting external sensors (pressure sensors, lasers, etc.) to MAX/MSP. Situated in the Gallery@Green St, "Pressure" is a site specific installation where computer controlled sensors manipulate the sights and sounds of daily commuting to address issues of accelerated culture and the evolving metaphors for speed and progress. Pressure seeks to explore the psychology and physicality of individuals in the contemporary urban landscape.